How do I remove wallaper? If wallpaper was originally applied correctly then you can usually strip the top layer of vinyl off by peeling away at the seam or an edge. Sometimes only small pieces can be removed by dry stripping exposing the the backing paper. This layer can normally be removed by wetting or using a wallpaper steamer. Crockers hire these machines. Often the top layer of vinyl or vinyl coated wallpapers need perforating with a Paper tiger. This device is a small hand held tool with small wheels that have sharp teeth that break the surface of the wallcovering. This enables steam or moisture to penetrate into the layers of wallpaper. You can then use a metal scraper to remove wet wallpaper. This should come away reasonably easy. If wallpaper was originally applied to an unsealed surface (eg bare gyprock) the surface may be at risk of damage when you try to remove it. In this situation further assessment may be needed eg you may need plaster repairs or there are wallpapers we sell that are ideal for difficult walls with imperfections. Ask us what we recommend. Yes and no. We don't recommend this but understandably some wallpaper will not budge and even if you try with steamers, scrapers, hot water stripping solution etc etc and you can't remove you may have no choice but to paint it. If so, then you will need a good covering undercoat. We may recommend either a water or an oil based with good adhesive properties. It will depend on the wallpaper type. You can also use Zinsser Shieldz if you plan to re- wallpaper over existing paper. Before you paint it you must be sure all seams and edges are firm. Peel away loose parts of the paper, and fine fill certain areas to even the surface out. Sand and then undercoat. You can then paint. How come some areas are stuck and ruin the plaster or gyprock when i try to remove the wallpaper? This is usually due to the wallpaper having been hung to a bare gyprock wall. If the wall had of been sealed and painted you would not have the same problem. There is no guarantee that you will remove this wallpaper without gauging the gyprock. It may be best to re wallpaper over the top. There are different types of wallpapers so do I hang them the same way? Hanging is usually the same but glue application can vary and this depends on the wallpaper and it's instructions. Please visit our How Tos and Handy Tips for more comprehensive information. Do you have a guide I can use to help me wallpaper? Yes we do. Compliments of Vision Wallcoverings you can download the Wallpapering made Easy guide here. You should contact us as retailers to discuss any of the steps should you need to. Is wallpapering hard to do? Wallpaper is a DIY product. Some people are happy to try for the first time and with the correct preparation and with our advice it is possible for you to achieve a nice result. Most of our customers are surprised how good they actually did the job! There are some wallpapers that people prefer to have a professional install the wallpaper and sometimes we may recommend a wallpaper hanger who is experienced in hanging to do your job. This will depend on the area, height and the type of wallpaper. We have some reliable wallpaper hangers that we can recommend if you need someone to do the job well. So generally no it's not hard, but you need to follow the steps and take your time and with the correct equipment, preparation and advice there is no reason why you can't do it yourself. Should I open my rolls of wallpaper to check there are no faults? Before any wallpaper is hung it should be inspected to ensure there are no printing faults or marks. Occasionally a fault may be detected. Please do not proceed and hang the wallpaper. It may need to be replaced and we will need to check it first before requesting more rolls to complete your project. What are the best patterns for me to use? It is totally up to you what patterns you choose. Wallpapers are used in every room of the home so we would recommend you have a look at your surrounds and decide what overall look you like. Get ideas from magazines, in shops, cafes, hairdressers, and other homes and online. Allow a few hours of browsing time before deciding on a pattern. Wallpaper is designed to be there for years if you choose to leave it, so take your time before making the final decision. Should I wallpaper by myself or have someone helping me? Hmmmm...that's a hard one. If you work well by yourself and have your own way of being organised then we may suggest work by yourself. If you feel more confident having someone else helping then that's okay too. The second person may help by being a labourer eg pasting a drop of paper while you are hanging another. Have the same person on the same job so you do not get inconsistencies. Will you refund wallpaper if I decide I don't want it? Unfortunately we do not refund rolls of wallpaper. This is because we have ordered the wallpaper from a supplier who orders directly from overseas. These orders are non refundable. What happens if I have a roll or two left over? Can I return them? We do not take excess wallpaper rolls back. Sometimes you will have excess because if there is a risk of you having a shortfall, we may suggest you order extra. The reason for this is if you run short during installation, the chance of getting the same run number again is decreased. It is best to have more than less. It's also good to have in case you get some damage in the future. At Crockers we do our best to assist you to work out quantities. We have online calculation methods and we can also recommend a paper hanger that may be able to measure and give you a quantity needed. You will also need to consider the wallpaper roll size and it's pattern repeat. We will help where we can but will not be held responsible for over or under ordering. What we order will always be per your instructions. How do i know if i have oil based or water based paint already on a surface? Rub the surface with methylated spirits. If some of the paint colour comes of onto the cloth then it's most likely water based. If it doesn't appear to remove any then it is most likely an oil based enamel. My bathroom has been previously coated in an enamel and I now want to use a water based finish. What do I need to do? The walls need to be thoroughly washed with a mix of water and sugar soap such as Bartoline Sugar Soap, rinsed and sanded so that no gloss remains. One coat of acrylic sealer undercoat (Haymes UltraCover) is necessary for adhesion before two topcoats of preferably a satin acrylic is applied. If I paint a large wall inside, will the colour look lighter or darker than the colour chip? Lighting plays a huge part in the appearance of a colour, but generally the colour will look darker when seen on a large, interior area. Colours chosen for outside can appear much lighter. In some cases two or three shades lighter! It's always best to purchase a sample pot prior to buying larger quantities. How much paint do I need to paint a small bedroom? As a rough guide, most acrylic interior wall paints will cover about 12 square metres per litre, but always check the manufacturers label. If you work on around 4lt's of wall paint per average sized room for two coats you will go close to getting it right! Remember to calculate enough paint for two coats. The Haymes paint calculator can also help you to estimate how much paint you may need to paint other rooms. Must I always use two topcoats of interior wall paint? To ensure the proper durability and washability of paint, two coats must always be used to obtain a thick enough film build. Two coats are also important for even colour coverage and for an even finish. I want to paint a high traffic area in a very dark, bright colour and still have good washability and scrub resistance. Is a low sheen acrylic good enough for this use? Generally speaking, the lower the gloss and the darker the colour, the more noticeable marks, such as scuff marks, will be. For high traffic areas the choice of a satin acrylic or oil based finish may be the better option. Where scuff and scrub resistance is a high priority, (irrespective of colour) enamel paints are the preferred option. Resistance properties generally improve with increasing gloss level. We now have a quality water based enamel finish and the Haymes Trim Semi Gloss Acrylic would be perfect in this situation. It can also be used for exterior applications. I have chosen a bright colour to paint my interior walls with. Why do I need to use a tinted undercoat? Because strong colours are tinted from a Clear or an Accent Base, the opacity of the finish comes mainly from the tinters. Some tinters, especially the yellows and reds, do not have the opacity to provide good coverage, regardless of the brand of the product or the tinter. A grey undercoat underneath helps these colours to have an even finish and to provide a solid colour. Sometimes certain colours will work over existing similar colours, however to avoid needing excess coats we will suggest when it will be best to apply the tinted undercoat. This is usually discussed once you have made your colour choice. Why shouldn't an 'exterior only' grade paint be used inside? In terms of film properties, there is no reason why exterior paints can't be used inside. There may be other reasons (eg sheen level) why they may not be considered suitable. Drying times may also have to be extended. The exterior of my house has been painted many years ago with an enamel. I now want to use a water based on top. Is that OK? The most important first step of preparation in this situation is to ensure that the existing paint is stable by doing a cross adhesion test. This is done by using a sharp blade to cut a deep, close together 'naughts and crosses' pattern in the existing paintwork. Press a piece of masking tape over the cut area and press down firmly. If any paint comes off when the masking tape is ripped off quickly, the old paint is not stable and therefore must be completely removed. If the paint does not come off at all with the masking tape, and as long as the surface is washed with warm soapy water, (to remove any contaminates) and sanded thoroughly (to remove any gloss), an exterior grade acrylic designed to be applied to a surface without an undercoat, can be applied. Two coats of this acrylic is always necessary for protection. If you are unable to sand the surface we would recommend using an undercoat that has high adhesion properties. We recommend using Haymes Ultracover. As the saying goes "When in doubt, undercoat!" I have a metal balustrading on my house that has rust spots coming through and some flaking paint. How do I fix it in order to repaint it? NB An exterior acrylic paint may be used as a top coat if rust is not excessive. We may also recommend to use a product called Penetrol which can act as a surface primer and conditioner. It will also prevent rust and help with paint adhesion. Is an oil based or water based paint better for outside? It depends on what is being painted. For the majority of surfaces, an acrylic is going to last longer. Acrylics are softer, more flexible, and more resistant to chalking. This is because the acrylics have a much higher elasticity rate, so that when the surface, such as timber, expands and contracts with the weather, the paint moves without cracking. Haymes Acrylic Trim Gloss Paint is suitable for areas such as sash windows or any other situation where two surfaces are touching. This is because the general exterior acrylics, being softer, have the tendency to stick to themselves in hot weather, so using this Haymes product will avoid sticking. Oil based primers etc. are necessary for any ferrous metal, such as steel. Can brand new Colorbond be painted with a 'no primer' exterior acrylic? Which climatic conditions are ideal for exterior painting? Between 10-35 degree celsius and not when there is very high humidity (above 85%) or windy conditions. Avoid painting directly in the hot sun, since the surface can often be up to 10 degree celsius hotter. When painting outside in hot weather (i.e. porous surfaces using water based paint) dampening the surface slightly with clean water will help with the application. In winter time it is best to get a coat on by around 11am. Painting later in the day limits the dry time and it may not be possible to put further coats on until later the following day. There is also a risk of dew settling in and causing blooming (water marks) which is noticeable on darker colours on exterior surfaces. I live along a harsh seashore environment, where there is high humidity, wind-driven rain, and salt. Which is the best product to use, an acrylic or oil based paint? Acrylic paints have demonstrated outstanding durability in the most rugged of environments, including direct sunlight, moisture from rain and snow, and at the seashore. Due to the superior adhesion of acrylic paints, they don't tend to blister, crack or flake when exposed to rain or high humidity, compared to oil based paints. Note: Prior to painting, wash away any salt deposits found on the surface, along with any chalking. Remove all dust and dirt from the surface and apply a solution of 10% Hydrochloric Acid and water using a brush or broom. Allow the acid to remain on the surface until all the fizzing has ceased, then thoroughly rinse the treated areas with liberal amounts of clean water. Allow to dry for at least a week before dusting and coating. How do I know what roller cover to use? Generally, short nap rollers such as a 5 or 6mm nap are designed for gloss paints and longer nap rollers are used for flatter finishes. The shorter the nap, the smoother the finish is going to be which is ideal for a gloss paint. Low sheen or flat paint requires a longer nap on the roller such as an 12mm or higher to provide a high enough film build. Crockers have a large range and we will recommend one to suit your needs. Can I still paint on a cold day? The drying process is severely retarded and paints, especially solvent based paints completely stop drying when the temperature is or falls below 10 degrees. This is why manufacturers put a statement on their labels advising against painting in cold conditions. Even when the temperature is 14 or 15 degrees, the drying time of the coating is going to be dramatically affected, so it must always be taken into consideration. On cold days stop painting about mid afternoon so that the paint gets a chance to dry to a certain extent before the cold overnight temperatures and dew sets in. It is strongly recommended that a wallboard sealer (or sealer undercoat) is applied as it provides a uniform surface for subsequent coats, and contributes to colour and sheen uniformity in the finish. Can acrylic paint go off? 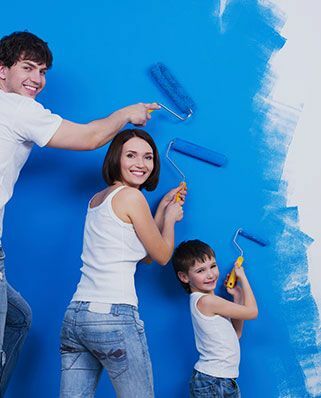 Water based paints can be attacked by bacteria, (causing a foul smell) but this happens very infrequently these days. Paint stored in a well sealed container will have a shelf life of at least 2 years. As a general rule, if the paint can be readily stirred into a uniform condition it will still be ok to use (irrespective of its age). To help with shelf life of paint, pour into, and brush and roll out of, a separate container. Avoid pouring excess paint back into the can and this will keep the can fresh and less likely to become contaminated. I bought a semi gloss enamel paint but it's shiny like a gloss. Why? Semigloss enamels will be shiny as they dry. Over a period of about 2-3 weeks they will dull off and be noticeably less shiny than when you first applied it. I want a non yellowing paint. Which one should i buy? Oil based enamels will yellow and deepen in colour with age or if the room is dark. Buy a water based enamel eg Haymes Ultratirm Acrylic in gloss or semigloss or Krysler Premium Gloss Acrylic. These finishes give a bright white appearance and will remain white over time. They are also very hard wearing. I want to paint a masonry wall. Do I use a primer or sealer? A sealer is recommended in this case to keep the top coat from being absorbed unevenly. Applying a sealer will make the finished job look smooth and uniform. When do I need to apply a primer or undercoat? A primer should be applied to any surface that has never been painted before. When repainting, a primer is needed when the surface is uneven in porosity, or when the surface has been stripped of paint or is worn down to the substrate (eg. bare metal). When I purchase paint in a particular colour, can I be guaranteed it will match the colour card? Colours shown on the colour cards are as close as printing processes allow. The paint itself will appear darker in large areas and shade variations may occur as gloss levels vary. We would suggest buying a 500ml sample pot at a small cost first to ensure the colour is as you expected. Some companies will supply printed charts and like magazine print is not an accurate representation of the colour. I chose my colour scheme from a magazine but when i bought the paint it was different. Why? Magazines are great for getting an overall idea of a colour scheme, but when it comes time to decide you should always buy test pots. The sample pots we mix is how the paint colour will be. Your home can have many influencing factors that can make certain colours change, so use the magazines for an idea only. Photographs can be edited these days and so lighting etc can change the colour within the picture. Why are ultra premium products better than the other ranges? Not only are the raw materials that go into the making of the product better quality, but the manufacturing process also plays a part in the degree of quality of the products, for example, the amount of time the paint is actually milled for. A top quality product will tend to be easier to apply, more washable, more durable and more resistant to harsh weather conditions. Relative paint quality is dependant on a number of factors including material selection and material content. Lower quality paints' formulations can be 'cost trimmed' and therefore not give the same performance. How can I remove mould from walls and ceiling? Scenario: Bathroom walls that have been previously painted in a water based paint. Due to lack of ventilation the room is very moist and a black mould has grown on the ceiling and upper section of the walls. Answer: The only real long term solution for this situation is to eliminate the cause of the problem by improving the ventilation in the room. The walls then need to be washed down with a solution of household bleach and water or a mould killer/cleaner eg Mould Action and then rinsed thoroughly. A preparatory coat of an anti-mould solution is necessary for bad mould and then two coats of a premium quality satin acrylic or enamel with the addition of a fungicidal additive into the paint should be applied. I used bleach to clean down mould but it came back. Why? Bleach will only whiten the areas where mould is growing. It actually does not kill the mould spores. Use a product called Mould Action and leave it 24hours before rinsing. This will kill spores. If the stains or marks from black mould are still visible you will need to use a stain blocker eg Haymes Ultralock prior to painting. Try to improve ventilation and put an anti mould additive (VC175) into your paint. My floors have been previously coated in a polyurethane, can I put a two-pack polyurethane on top? If the previous coating was a turps-based polyurethane, a two-pack polyurethane will react like a paint stripper on the single pack, due to the solvents being a lot stronger. If the previous coating was also a two pack, it is still recommended that the coating be completely removed so that adhesion between the two coatings does not become a problem. If the coating is not going to be completely sanded off, thorough sanding of the surface to a dull matt finish is required to ensure adequate adhesion. Yes you can paint plastic. We have a range of spray paint that can be sprayed direct to plastic with no primer. Krylon Fusion for Plastic is a fantastic range of aerosols that have been designed for painting plastic plus more. Or, if you want to paint something that is in an area not suitable for spray painting we also have a range of suitable primers that can be brushed or rolled. We always recommend that the surface to be painted is clean and free from oils or grease. Whenever you are painting plastic, always allow time for the finished coats to cure. Curing time means "hardening up" This is different to drying time. The longer you leave these surfaces to cure the more durable the finished coat will be. To give you an idea you should allow at least 7 days for Fusion, and longer if your paint colours have been tinted darker colours. Am I able to paint my swimming pool? Yes! We sell and recommend Luxapool Swimming Pool Paints. You can find all of the information required to get a professional finish by visiting our online shop in the Pool Paint section. Using a stain directly onto the timber is not generally recommended for two reasons. Firstly, it is very hard to achieve an even finish on such a large flat area. Secondly, if the floor coating wears through and into the colour, it is almost impossible to touch up the stain without having to sand completely back to raw timber. To avoid these problems, it is best to add a small amount of dye/spirit-based stain into the first one or two coats of a solvent based clear. Always finish off with a clear coat so that when the floor wears or gets scratched, you are only affecting the clear coating. Generally, a two-pack polyurethane eg Norglass Northane Clear Gloss, or a single pack moisture curing polyurethane gives the best overall protection. Haymes Easy Floor Gloss is also an excellent product to use. Can i use a clear coating of some kind on my timber decking? Most paint companies will make their timber finishes with a slight pigment. We call this "natural". We do not usually recommend a clear because it offers the least protection from the sun. The natural colour of the oil (usually a honey or browny yellow colour) will enhance your timber's natural colours and give it longer protection. My timber decking is really grey. Can i oil or stain over this? NO. We would recommend a wood cleaner first. This will lift dirt, mould and any buildup of grime out of the grain of the timber. We sell a few brands and we would recommend the most suitable one for your project. Call to discuss. If you oil or stain over grey timber you will only enhance the uneven dirty colour of the grime and will make it impossible to remove- unless sanded back. You may also need a deck sealer remover and hence you have just made your job tedious and messier! I bought a satin polyurethane but it is drying very shiny as if it is a gloss finish. The majority of time, this problem occurs because the customer has not stirred the product sufficiently. Satin polyurethane's are basically a gloss polyurethane with a flattening base added. This flattening base has a tendency to settle to the bottom of the can, so if the customer does not stir the product, they are using only the gloss polyurethane portion from the top surface of the can. Every product must be stirred with a wide flat stirrer such as a ruler, before and during use. What are the advantages of using a sealer before coating my floors with a solvent based coating? I'm using a polyurethane and the first coat was fine. When I applied the second coat the first coat wrinkled and bubbled. Why? The reason this happens is that the first coat has not dried thoroughly and the wet solvents in the second coat attack the moist solvents in the first coat. The first coat may not be dry for several reasons such as temperature, film build is too thick, moisture or naturally occurring resins in the timber.